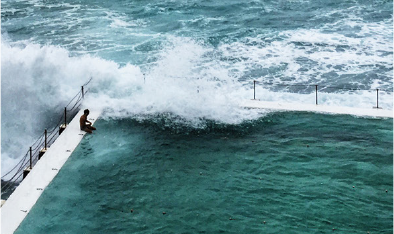 When you think of Bondi, there are a few images that come to mind – going for a dip in the clear blue water, soaking up the Summer sun with an icy Paddle Pop in hand, and spending the day in a good ol’ fashion pair of Aussie boardies. Two people who fully understand the necessity of owning a beautiful pair of trunks are Jake and Lei-Ahna, founders of Good Time Trunk Co.
We welcomed Good Time Trunk Co to Bondi Markets a while back, and have loved seeing this bright, joyful stall flourish at our coastal marketplace. Catering for children and adults alike, their playful, contemporary patterns have been adored by Bondi locals and just about everyone else that stops by the Sunday Markets. Take a look at their designs and you’ll see why! So where did the idea for Good Time Trunk Co stem from? Jake had always loved his boardies and had forever been trying to find ones that were a little bit ‘different’ to what everyone else was wearing. Throughout his teens and early twenties, he conned his Mum into copying the patterns of his favourite pairs, then re-creating home-made versions. Hunting fabric stores and op-shops, he found kids’ curtains and cheesy Hawaiian shirts for his mum to convert. Many didn’t survive the rigours of a young larrikin lifestyle, but those ‘home brand’ boardies became somewhat of a signature. Jake and his mates loved them, and it was this deep-seeded love affair with board shorts that lead to the creation of Good Time Trunk Co.
Good Time Trunk Co takes pride in their colourful, vivacious designs that buck the monochrome trend currently monopolising our surf store shelves. Their ethos centres around deliberately not following current styles, to provide board shorts with a difference. Good Time Trunk Co is the black sheep, in full colour.